There are certain roles which tend to consume an actor's career -- and one of the foremost of such roles is that of the world's most famous consulting detective, Sherlock Holmes. From William Gillette to Basil Rathbone, from Jeremy Brett to Benedict Cumberbatch, the figure of Holmes has cast a long shadow across the stage, the movie screen, the television screen, and, of course, the radio microphone. But when discussion of their hero among Baker Street habitu�s turns to dramatic presentations, one Holmes is often overlooked. He only played the role for a very brief run in the 1950s, on a medium which was fast falling under eclipse, and the breadth of his career away from the Holmes role was so vast and so impressive that what might have been a career-defining part for a lesser actor became a mere footnote. That actor is Sir John Gielgud, one of the towering figures of the twentieth-century stage -- and a pretty fair Sherlock Holmes. John Gielgud's credits read like a timeline of high points in British entertainment spanning nearly eighty years. He began acting early in the third decade of the twentieth century and lived on to see the dawn of the twenty-first. In between, he earned every possible award given in his profession, and redefined certain roles for the ages -- his Hamlet still towers, and yet he could be just as impressive in dryly comic supporting roles in lightweight Hollywood films. Born in 1904 to a theatrical family, Gielgud's stage career began with minor Shakespearean roles at the Old Vic, and advanced rapidly as he continued his education at the prestigious Royal Academy of Dramatic Art. By the mid-twenties, he was attracting notice in West End shows, making silent films, and taking his earliest steps into broadcasting over the BBC. From Chekhov to Coward, Gielgud shone in the best roles the British theatre had to offer. He returned to the Old Vic in 1930, not as an obscure bit-player on the fringe of the cast, but as an acknowledged star. Sir John Gielgud stars as Sherlock Holmes with Sir Ralph Richardson as Dr. Watson. 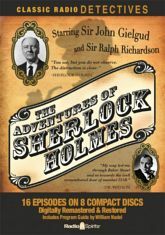 John's brother, Val Gielgud, the celebrated mystery author and producer, directs several episodes and co-stars in one of them�as Sherlock's brother! As a finishing touch, Orson Welles plays the evil Moriarty. The shows created by this very special team are possibly the greatest Sherlock Holmes radio programs ever produced. This set features all sixteen episodes in their most complete surviving examples -- taken from what currently exists of the syndication masters. Come hear tales of mystery and murder, espionage and intrigue, revenge and resolution in the gas-lit London of Queen Victoria, hansom cabs, and one brilliant Baker Street detective. Includes a Program Guide. And then came tragedy. Gielgud returned to Britain following the completion of the film and became enmeshed in a personal scandal involving his sexual life which threatened to shatter his career. He insisted on continuing to perform through the crisis, but it took a heavy toll on his emotional health. He took more than a year and a half off from stage roles, concentrating on his directorial career -- and on radio. It was at this difficult stage of his life that he crossed paths with an enterprising independent producer named Harry Alan Towers, who had had considerable success distributing transcribed British radio productions to independent stations in the United States. Towers had secured the rights from the Arthur Conan Doyle estate to produce a new series of Sherlock Holmes dramas -- and Gielgud seemed an ideal choice for the lead role. 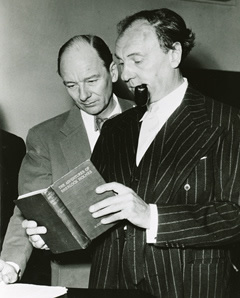 With longtime friend and stage colleague Ralph Richardson cast as Watson, and John's brother Val Gielgud directing, the series began over the BBC's Light Programme in the fall of 1954. It was a crisp, dignified production which hewed closely to the Doyle canon, avoiding the lapses into bumbling comedy around the character of Watson which had occasionally marked the various American Holmes series. Gielgud gave Holmes just the right blend of eccentricity and genius, while never lapsing into any quality of voice or manner that might remind the listener too heavily of Rathbone. Twelve episodes were recorded in the initial series, and Towers was able to run the program in America with the NBC network, premiering in January 1955. It was a chancy move -- Holmes had been broadcast in various series in the United States since 1930, and several actors had taken turns at the part, but none embodied the role more thoroughly than Basil Rathbone. It had been nearly eight years since Rathbone had left the part, but his performance continued to define the role for American listeners. Towers needn't have worried, however. Gielgud's performance was eminently acceptable to what remained of the American radio audience, and a short series of four new episodes went into production to fill out the NBC run. Orson Welles, who had admired Gielgud for years (and had worked for Towers earlier in The Lives of Harry Lime and The Black Museum) joined the cast as Professor Moriarty in the final program of the series, a dramatization of Doyle's "The Final Problem." By the end of production of the final Holmes episodes, the furor surrounding Gielgud's scandal had faded, and the actor resumed his stage and film work. He was no longer the rising young star, nor the master of the West End, but as he aged into his fifties he became an elder statesman of the theatre -- a theatre which was moving progressively away from the classically-oriented shows in which he'd made his name. He was always in demand when a new Shakespeare production came around, but the experimental productions of the postwar age called for a different style of acting, a different sort of personality. 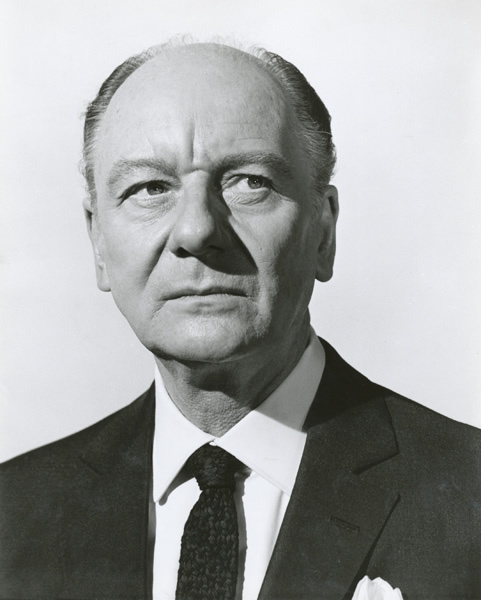 By the 1960s, Gielgud's stage roles were fewer and farther between -- leading the actor to place an increasing emphasis on film and television work. On the screen he alternated between classical parts and sensitive, dignified character roles in more contemporary films. His roles were often small, but they never went unnoticed. He even brought a small bit of value to one of the most distasteful feature films ever made, the notorious Bob Guccione-Gore Vidal production of Caligula in 1979. Such a role might have proved humiliating to a performer with a greater sense of his own importance, but Gielgud always believed that you weren't an actor unless you were actually acting. He made his most popular American film in 1981, as the dryly witty butler Hobson in the broad comedy Arthur. The film itself offered a script little removed from a television sitcom, accented by cheerfully offensive dialogue, but Gielgud brought tremendous dignity to the role -- and earned an Academy Award for his efforts. After this late-career triumph, Gielgud began to ease his workload as he moved into his eighties. His fading memory made learning lines a chore, but radio required no such study -- and he appeared frequently in BBC radio productions during the 1980s and 1990s. He had first been knighted in 1953, and continued to add to his honors as he moved through the final years of his life. His final acting role was silent -- a fleeting appearance in a David Mamet film in 2000, just before his death that May at the age of 96. John Gielgud was only Sherlock Holmes for a few months, recording only a small number of episodes in the role. But those episodes have been in near-constant demand all over the world for more than sixty years -- and whether you hear them for the first time or the fiftieth, they retain their quality and their appeal. Gielgud may not have been the definitive radio Holmes -- but his performance is well worth discovering. Copyright 2015 Elizabeth McLeod and RSPT LLC. All rights reserved.